The steps involved in a robotic-assisted pyeloplasty can be simplified into a 12-step method. 2. Transperitoneal exposure of the retroperitoneum using standard laparoscopy. 3. Dissection of the pelvis, ureter, and possible crossing vessel. 4. Docking of the da Vinci Surgical System. 5. Transection of the ureteropelvic junction and excision of diseased segment. 6. 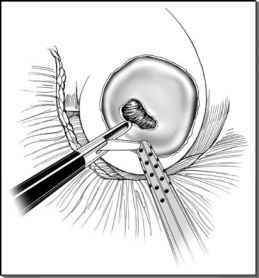 Spatulation of the ureter laterally. 7. Apical and posterior wall suture placement. 8. Guide wire and stent placement (if not placed at the beginning of operation). 9. Anterior wall suture placement. 11. Reretroperitonealization of the kidney. 12. Placement of JP drain and exiting of the abdomen. During pyeloplasty, the transperitoneal approach offers ease in identifying, dissecting, and mobilizing intraabdominal structures, whereas the potential disadvantages include prolonged ileus, adhesion formation, and injury to adjacent viscera. Several experiences with robot-assisted laparoscopic pyeloplasty have demonstrated the feasibility of this technique in providing improved surgical dexterity and decreasing operative times. We exclusively performed the Anderson-Hynes pyeloplasty repair using the da Vinci® robot. This repair is the gold standard for open pyeloplasty repairs and the robot allowed us to duplicate this procedure in the most complicated cases. Intrinsic problems were easily excised and repaired. Exposure and repair of extrinsic problems such as crossing vessels were readily addressed. The major advantage of the retro-peritoneoscopic approach is that it provides a direct route to the UPJ and allows access without interference from intra-abdominal structures. However, the working space is more restricted and the absence of anatomic landmarks may make dissection more cumbersome for the inexperienced surgeon.